« Dating Your Husband: Season Passes! Microwaves. They are completely common place in our everyday world. They heat up a fast meal. They make leftovers warm. Even steeping and steaming a hot beverage or two. You want it warm, thirty seconds to a minute and you are so good. Like I said, everyday common place item. For the most part we don’t give them a second thought. That is until they break. I heard that oh so familiar ding, grabbed my soup, dug in and took a spoonful bite. Ugh. Cold. Stirred it up, popped it in for another minute. Ding. Still cold. Like flipping a light switch on and off in a room to make sure the light is really broken, I kept heating my soup for three or four more times. I think I was living in denial. I didn’t want it to be broken…even more so I really wanted my soup. I was hungry and in a hurry. But it was what it was…broken…kaput…done in…dead. It was not the fanciest and prettiest microwave at the ball so for the cost of fixing it, you might as well buy a new one. One snag…the previous owners thought it was a good idea to buy an all in one microwave and oven combo. Replacement cost…wait for it…$2250 for a very basic model!!! Well, we will be looking into repair costs…did I mention that the oven wasn’t working quite right either? In the meantime, we work at living without a microwave. No problem right? 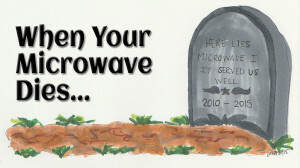 People lived without microwaves for decades prior to the now mandatory staple of the modern kitchen. How hard could it be? I mean, really, it’s just a microwave. That night…hubby and son come into the family room where I’m writing my latest blog post. Next morning, I grab half a breakfast sandwich that I had leftover from the day before. Pull out a plate, open the sandwich and prepare to heat it up. As habit dictated, I opened the microwave, put in the cold breakfast sandwich, and hit the instant 30 seconds. Wait for it…half way to the coffee pot I remembered. The microwave…is…broken. Ugh. Family surviving without a microwave…for now.